Prep for our Boneless Leg of Lamb recipe in just 15 minutes! 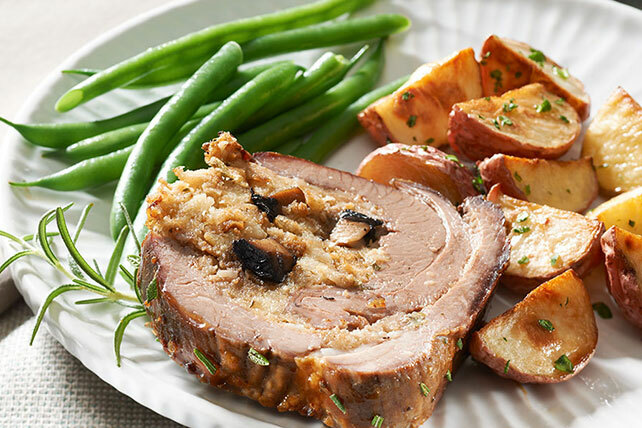 Then continue with the Boneless Leg of Lamb recipe for a tasty stuffed leg of lamb dish. Heat oil in large nonstick skillet on medium-high heat. Add mushrooms; cook and stir 5 min. or until mushrooms are tender and liquid is cooked off. Cool slightly. Meanwhile, prepare stuffing as directed on package, reducing water to 1 cup and butter to 2 Tbsp. Add mushrooms and cheese; mix lightly. Place lamb, cut side up, on cutting board; press to flatten. Spread with stuffing mixture. Roll up, starting at one long side. Tie closed in several places with kitchen string. Place in 13x9-inch baking dish. Pour dressing over lamb; sprinkle with rosemary. Bake 1 hour 20 min. or until lamb is medium-rare doneness (150°F). Remove from oven. Cover with foil; let stand 10 to 15 min. or until medium doneness (160°F). Balance this special-occasion entree with smart side dishes. For example, choose a small baked potato or roasted potato wedges and a hot cooked green vegetable. Look for lamb that is pinkish red and has a velvety texture. Dark red meat usually indicates the meat is older.